What is the difference between population transfer, polarization transfer and coherence transfer in a quantum system? What Shannon channel capacity bound is associated to two coupled spins? What does magnetic susceptibility tensor mean? Optimal measurement by projectors for density operators! It seems that the Bloch equations, or a suitable generalization thereof, are enough to phenomenologically model the measurement process in NMR. Has anyone attempted a fully quantum mechanical model of the NMR spin system and measurement coil together? It seems to me that these coils are intentionally of low quality to ensure no back-action (more phenomenology, so far as I can tell) on the spin system. But perhaps one can engineer more efficient control or parameter estimation strategies with high quality coils and an accurate quantum mechanical model of the measurement interaction, no? I don't quite follow. How would a low quality coil prevent back action? Energy is dissipated too quickly, I presume. Interesting that recently as a part of my TA job I was worrying about precisely this question. Searching on the net I couldn't even find what is the Hamiltonian that is used to model the system. Its not completely clear and seems to be a lot of phenomenology as to why there should exists these two time-scales of $T_1$ and $T_2^*$. Also the entire argument is quite shady as to why there should arise a net polarization in the sample - it is after all a competition between the randomization effect of room temperature and a moderate magnetic field. And the Zeeman splitting picture also can't be entirely correct I would guess since z-spin eigen-states don't make sense in a magnetic field. Hence to sum it up - I am also looking for a good fully quantum analysis of this effect! @JoeFitzsimons Here is a semi-classical argument (the first theory of the back action -- called radiation damping -- I do believe): http://dx.doi.org/10.1103/PhysRev.95.8. @JoeFitzsimons, these issues are surveyed by Anil Shaji and Carlton Caves in *Qubit metrology and decoherence* (PRA 2009)---the intuition being that "To make the analysis [of quantum limits] meaningful, we introduce resources." A Shaji/Caves-style analysis of resource restraints in NMR imaging and spectroscopy technologies--as contrasted with metrology technologies--leads to the guiding ideas that (1) a key resource is observation time, (2) key constraints arise from sample physics, and (3) a natural performance metric is the Shannon capacity of the sample-to-observer channel. @ChrisFerrie, stimulated by your general question, yesterday I asked a related concrete question "What Shannon channel capacity bound is associated to two coupled spins?". An early answer by Aram Harrow suggests that even this restricted problem is open. A generic model of a spin coupled to an oscillator is the Jaynes-Cummings model, for which a full-text arxiv search finds 1820 "Jaynes–Cummings" preprints (ouch!). So there is a lot of literature out there. As it happens, inductive circuit oscillators work worse as one makes them smaller-and-smaller, but mechanical oscillators work better-and-better, thus micromechanical systems are well-suited to studying the dynamics of measurement and noise at the classical-quantum boundary, which I take to be the focus of the query. For an experimental description of single-spin detection via a mechanical detector, see Rugar, Budakian, Mamin, and Chui "Single spin detection by magnetic resonance force microscopy" (Nature 2004), and for a POVM-style quantum analysis of the (noisy) detection process of this experiment, see our UW QSE Group's "Practical recipes for the model order reduction, dynamical simulation, and compressive sampling of large-scale open quantum systems" (NJP 2009). For a microscopy-centric look into the future see the PNAS survey Spin microscopy's heritage, achievements, and prospects. Because Jaynes-Cummings dynamics appears in so many guises, it would be a very considerable undertaking to provide a comprehensive literature review. It is a remarkable fact that over the past 65 years, single-spin magnetic resonance channel capacity has doubled approximately once per year, and there is quantum head-room for approximately 27 more such capacity doublings. Thus, if one is interested to press against quantum limits to speed and resolution in magnetic resonance imaging and spectroscopy, there is ample of work to be done, and plenty of scope for further improvements. So the NMR measurement is a one-way quantum channel (or is it a classical channel?) and you want to ask what the classical channel capacity is? In this information theory context (I like it! ), can I rephrase my question as: can one model the NMR measurement as a two-way quantum channel? If so, what is the quantum and classical capacity of this channel? 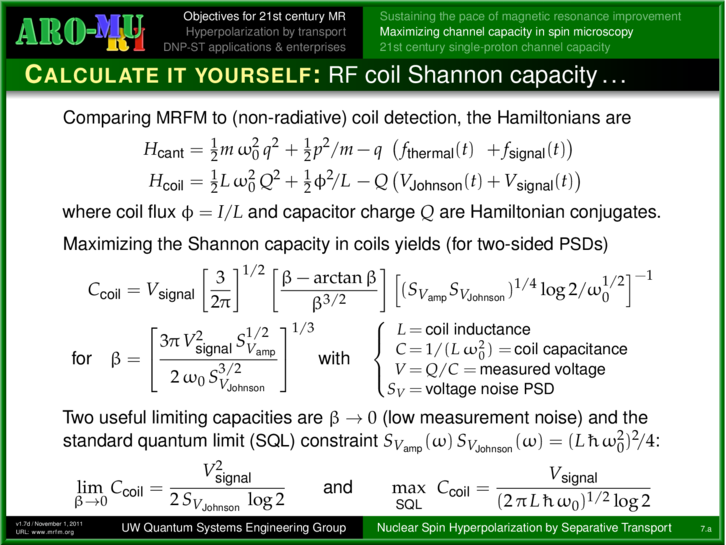 Chris, in the Hamiltonian shown above, the (transmitting) spin is treated as the source of a classical voltage; there is nowhere in the literature (that I know) a treatment of magnetic resonance channel capacity that is two-way, fully quantum, and experimentally realistic. @ChrisFerrie, to say a little more, I have often wondered whether a quantum spin microscope, viewed as a "small" sample spin (a proton or election) magnetically coupled by via a scalar or dipolar interaction to a "large" spin (an LC circuit, force microscope, or ferromagnetic resonantor), satisfies some sort of informatic reciprocity relation. That is, which channel has the greater Shannon capacity, "small sample spin" Alice sending bits to "large receiver spin" Bob, or vice versa? This might be a fun problem to work on (my intuition is that Alice can send more bits to Bob than vice versa). Liquid state or solid state NMR? In the liquid state NMR you can probably model the measurement process and apparatus as a weak measurement to incorporate the effect of the measuring device (say a quantum system with bosonic degrees of freedom). Here is a related paper by Lloyd and Slotine: Quantum feedback with weak measurements which is rather general but is definitely geared towards NMR physics. Despite that, I don't think there is a lot of room for maneuvering with this concept in the liquid state NMR. In solid state NMR (or even quantum dots), one deals with a single copy of the system and the back-action has a more significant effect. As for the high quality coil, superconducting loops are now used as measurement devices for the B field —macroscopic but very quantum systems (similar to a harmonic oscillator but also different). So I'd say the answer is a cautious "yes". The problem is from a practical point of view: there are other sources of noise in control and evolution of the NMR-like spin systems that would make this a far to reach goal. Sorry, I couldn't leave a comment so I left an answer. I took his concern to be about the current creating a field which effects the spectrum, rather than about the fact that you are making weak measurements. Could you fix the first link please? @JoeFitzsimons. I actually don't know enough about this subject but weak measurements _may_ be substituted for weak interactions with the measurement device. That's only one way of looking at this problem. @ChrisFerrie Thanks, I fixed the link. By the way, I looked at your profile page and you seem to work at IQC in Waterloo. I think you are probably working a few meters from some of the leading experts in this subject who are both great NMR experimentalist and also great theorists. They could definitely provide better answers. @Kaveh_kh: Yes I know, but I think this is a much stronger effect than the weak measurements actually being made on the system, and I suspect is actually coherent, which would affect the time dynamics (which are important since the spectrometer is essentially measuring change with respect to time). @Kaveh_kh: Indeed I do get work with one of world leaders in spin physics (In fact, I've wrote a couple papers recently with one). The problem is that quality of answers is not independent of the knowledge of the asker, if you know what I mean. I'd like an answer that abstracts as much of the "physics" away as possible. That is the way that I--and hopefully I'm not alone-- will understand it. @ChrisFerrie, one thing to keep in mind (which might even lead to good mathematics) is that noise in real-world magnetic resonance very often originates mainly in the *sample*. Thus in clinical MRI most of the lossy impedance (and thus noise) originates in the patient; this is why room-temperature coils are good enough. It *is* feasible to cool the spins in the patient; this is called "hyperpolarization" which is an aspect of transport theory. Hertz, Dirac, Feynman, Onsager, Kapitsa, Wooldridge and Landau all worked on transport theory...it didn't seem to hurt *them*...so why not you too?